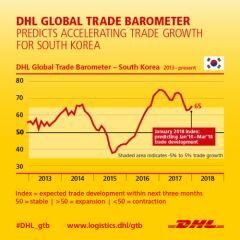 SEOUL, KOREA, Feb 6, 2018 - (Media OutReach) - South Korea's high-tech industry - a powerhouse of both innovation and export production - will add fire to the country's trade growth in the coming quarter, according to analysis from the Global Trade Barometer released today by DHL, the world's leading logistics company. The first ever Global Trade Barometer, an early indicator of global trade developments calculated using Artificial Intelligence, Big Data and predictive analytics predicts that South Korea's high-tech industry will continue to underpin the nation's trade growth, even as it experiences a slight slowdown in volume compared to the end of last year. South Korea manufactures nearly 20% of the world's semiconductor market and more than 60% of the world's memory chips, both of which experienced extreme growth in the past 12 months. "While the DHL Global Trade Barometer suggests a slight tapering of the heady growth rates experienced by South Korea's high-tech trade last year, we expect overall trade growth to continue to speed up as global demand for the country's technology manufacturing remains strong," said Charles Kaufmann, President/Representative Director - Japan K.K, CEO, North Asia, Head of Value Added Services - Asia Pacific, DHL Global Forwarding. "That may even cause GDP growth to level-up beyond its relatively consistent, steady pace of the past decade, even as South Korea continues to extend its streak as the world's go-to hub for technological innovation. The more intellectual property value the country adds to its technology manufacturing, the greater its prospects for growth." Much of that trade growth is expected to manifest in higher ocean freight volumes, driven especially by imports of basic raw materials needed to sustain South Korea's high-tech manufacturing as well as an ambitious pace of infrastructural investment. The Barometer's index value for basic raw materials jumped more than 25 points between December 2017 and January 2018 - one of the largest such increases for any sector in any of the seven countries included in the indicator's scope. "While air freight can expect a slight decline in growth over the coming few months, that looks likely to be more than offset by growth in ocean freight, feeding South Korea's national manufacturing engine," said Charles. "As the national economy plays to its strengths in technology production and R&D, ancillary sectors like machinery and vehicle production also remain strong. Businesses dependent on the country's exports, particularly those in the global tech industry, would do well to shore up their freight capacity as demand tightens; with lower air freight demand creating potential opportunities for more cost-efficient trade in consumer electronics and other short-lifecycle goods." Developed jointly by DHL and Accenture, the Global Trade Barometer provides a quarterly outlook on future trade, taking into consideration the import and export data of seven large economies: China, South Korea, Germany, India, Japan, the United Kingdom, and the United States. Together, these countries account for 75 percent of world trade, making their aggregated data an effective bellwether for near-term predictions on global trade. The Global Barometer, which assesses commodities that serve as the basis for further industrial production, predicts that global trade will continue to grow in the next three months, despite slight losses in momentum. DHL is the leading global brand in the logistics industry. Our DHL family of divisions offer an unrivalled portfolio of logistics services ranging from national and international parcel delivery, e-commerce shipping and fulfillment solutions, international express, road, air and ocean transport to industrial supply chain management. With about 350,000 employees in more than 220 countries and territories worldwide, DHL connects people and businesses securely and reliably, enabling global trade flows. With specialized solutions for growth markets and industries including technology, life sciences and healthcare, energy, automotive and retail, a proven commitment to corporate responsibility and an unrivalled presence in developing markets, DHL is decisively positioned as "The logistics company for the world".